I have said many times that reading Poetry is not my jam. I have mostly gotten over my entrance issues with science fiction and graphic novels/comics but Poetry still often trips me up. The funny part? I’ve been known to write it, but reading a collection can be too much, and I think that’s the real problem – a collection of poetry, of really good poetry is likely going to feel like too much. 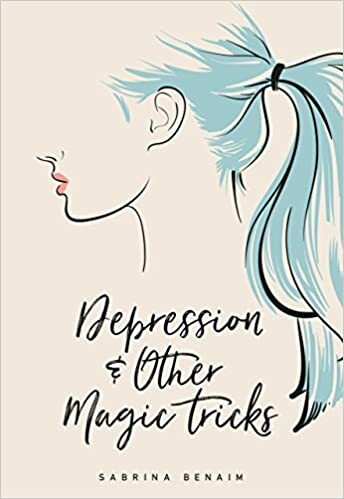 At times, Sabrina Benaim’s first published collection Depression & Other Magic Tricks did feel like too much, and I think I might finally understand that is really a good thing. As I mentioned in my review of No Matter the Wreckage, I am a fan of spoken word and Benaim is one of the most-viewed performance poets of all time. Her poem “Explaining My Depression to My Mother” has over 7,000,000 views. I’m not sure what writing to perform does to the structure of poetry, I leave that to you who study mechanics and craft to tell me, but whatever it is, it works. This wasn’t a perfect collection for me, but it may be for you. I did however feel seen, felt as though the person writing these poems, or at least many of them, knew the world the way I did and was able to get that knowledge out of themselves and back out into the universe, where it belongs so we can know that we aren’t alone. It is one of the best magic tricks I know. I struggle with poetry. Reading it never has the same effect as listening to it, even when I read it aloud to myself. But, since April is National Poetry Month I thought I’d give it another shot. 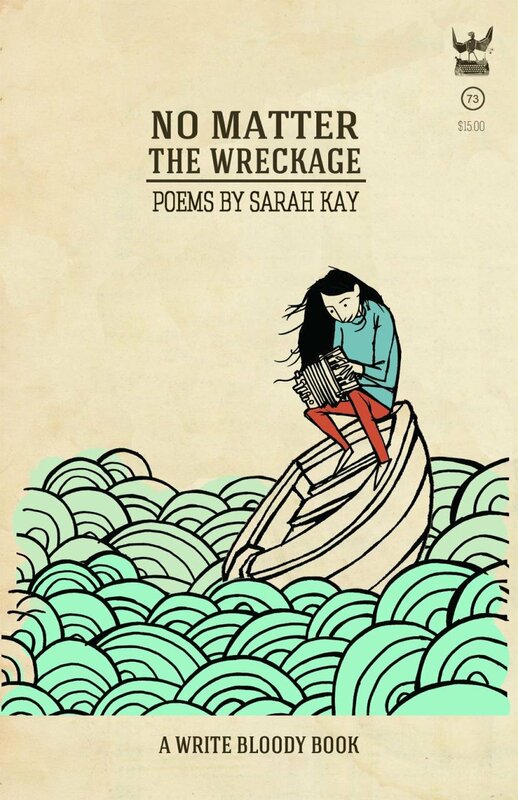 In an example of past me having current me’s back, one of the books I picked out for last year’s Read Harder challenge that I never got to was No Matter the Wreckage by Sarah Kay and it is a book of poems. I don’t know how I either a) hadn’t noticed or b) forgot that it was, because I was downright surprised when I was going through my shelves prepping April’s reading list to discover that I could knock off two birds with one slim volume. The other bit of good fortune? 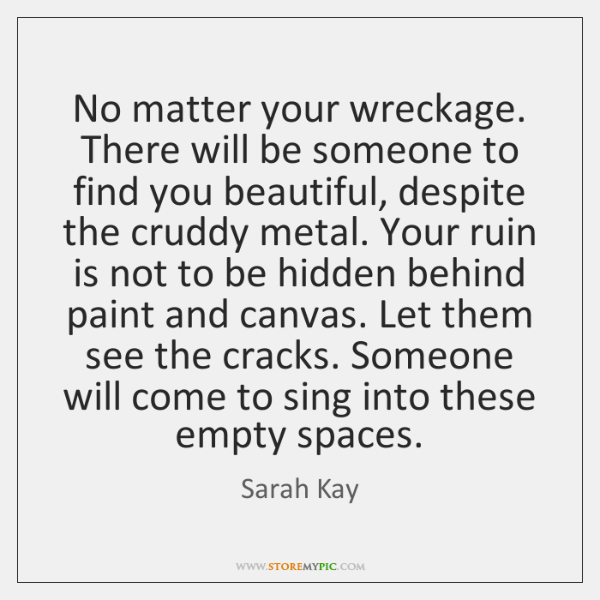 I was already familiar with Sarah Kay’s work and didn’t know. I had seen her spoken word performances over the years and loved them. Spoken word is really much more my speed, so reading a collection based out of that practice made these poems so much more accessible to me, and I can’t quite put my finger on why. 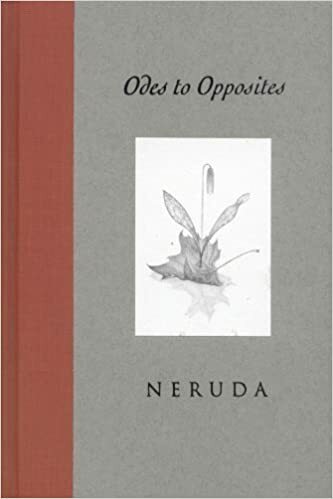 There’s something to the freeform nature of her work, of the way in which it is subject driven, a lot like Neruda’s Odes to Opposites, which helped my brain hold on. Not bad at all for a fellow I.B. kid. Every so often I come across a book and think, god I wish I was still in the classroom so I could get this book into the hands of kids. I think I’m going to email my friend who teaches reading and be all crazy about using this book, or parts of it, in her poetry unit. Where was this when I was trying to learn/understand/make meaning of poetry? Not even to get started about WWI Trench Poets and the passing of the 100th Anniversary of this war with very little fanfare. 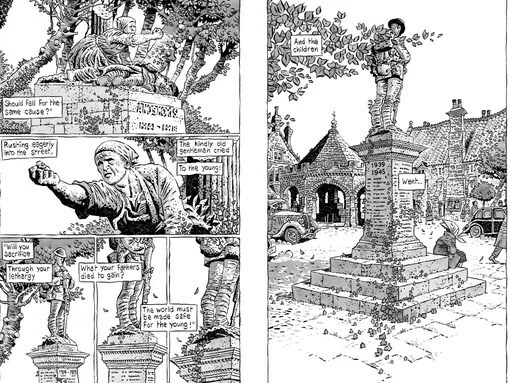 With New York Times bestselling editor Chris Duffy (Nursery Rhyme Comics, Fairy Tale Comics) at the helm, Above the Dreamless Dead is a moving and illuminating tribute to those who fought and died in World War I. Twenty poems are interpreted in comics form by twenty of today’s leading cartoonists, including Eddie Campbell, Kevin Huizenga, George Pratt, and many others. I am a graphic novel, graphic memoir, comics collection newbie. For those of you who read this format more frequently you will most certainly not have the entry issues I did in following the formatting. I also don’t read much poetry, but first person narrative works and songs have always been easier for me, since the meaning is more readily at the surface. However, there was still more to unpack, more to understand and the various artists who contributed to this work very evidently took the time to study their chosen poems and make interesting artistic choices as well as servicing the meaning and allusions in the various texts. And thanks to Shmookariah for putting this on my radar. I hope you had a nice Galentines/Valentines/President’s Day/”oh dear godtopus the Fifty Shades the Movie has been unleashed on us” weekend. Mine involved my siblings all in the same state for the first time in 2 years and snowstorms. All things considered, not bad. But we’re here to talk about what I read over the weekend. I have DNF’ed The Line of Beauty and if any of you can explain to me how this book ended up on my to read list in the first place I’d love to know. I only read 75 pages, but NOTHING happened and there was NO character development so that book had to be put down and my misery needed to end. There will be no further review of that book. But let’s get to the review of the book that I’m really here to talk about. It’s another audiobook, and we have Pajiba Love to thank for introducing it to me. In Pajiba Love there was truly delightful link to Richard Armitage discussing the process of recording an audiobook. Everyone needs to go check out the comments on that post provides links to Matthew Macfadyen reading poetry and then that led me to Hiddleston reading poetry… it was quite the day, really. What type of audiobook was this? A book of love poems. Read aloud to you by Richard Armitage, with his voice. HIS VOICE. So, after some internet sleuthing I discovered that on Audible I could have the audiobook FOR FREE (and it still is, I believe until March 9th (the same day as the Station Eleven Book Club Post! ), so you can get it for yourselves) and listen to Mr. Armitage read me fifteen classic poems. I was all in. I often have a tough time sinking into poetry and do best when I hear it aloud. So for that reason alone this is a good choice. I don’t know that I had ever really understood “The Passionate Shepherd to His Love” before this. All I have left to say to you is – off you go, go luxuriate in some well read poetry; including my favorite love poem of all time “i carry your heart”.